City Codes is a study of the representation of the city in the modern novel that takes difference as its point of departure, so that cities are read according to the cultural and social position of the urbanite. 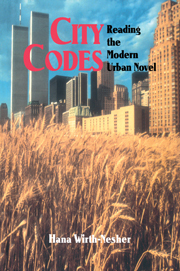 City Codes argues that the modern urban novel, in contrast to earlier novels, is characterized by an intersection of public and private space, but that this intersection is mapped differently according to the position of the city dweller in terms of history, politics, nationality, gender, class, and race. Part I. Introduction: Reading Cities: 1. Cultural models of the city - whose city? 2. Narrative cartography, or the language of setting; 3. The modern urban novel: new blueprint for self and place; 4. The itinerary: Warsaw, Jerusalem, New York, Chicago, Paris, Dublin, and London; Part II. Partitioned Cities: Spatial and Temporal Walls: 5. Issac Bashevis Singer's The Family Moskat; 6. Amos Oz's My Michael; Part III. Divided Cities: Social Walls; 7. Theodore Dreiser's Sister Carrie; 8. Ralph Ellison's Invisible Man; Part IV. Translated Cities: Domesticating the Foreign: 9. Henry James The Ambassadors ; 10. Henry Roth's Call It Sleep; Part V. Estranged Cities: Defamiliarizing Home: 11. James Joyce's Dubliners and Portrait of the Artist as a Young Man;12. Virginia Woolf's Mrs. Dalloway; Epilogue: Metropolitan musings; Works cited.